Yes, my THIRD book baby has officially been born! I’m SO excited for you to be here celebrating with me! If this were a REAL, in person party, I’d anticipate a few things. #2 – Talking/conversation. And with conversation usually comes questions. So I’m pretending YOU are asking me some common questions— and then giving my response. Sound fun? Let’s go! At the end, I’ll ask YOU some questions! 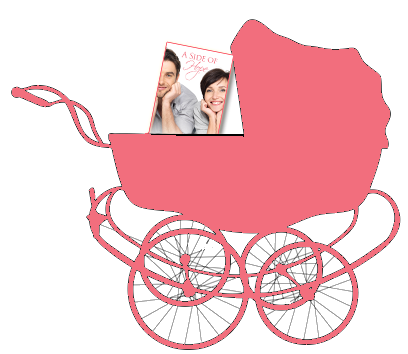 So Krista, tell us some fun facts about your new baby book! But some other fun tidbits…. – A Side of Hope features Tilly as the heroine, who I named after my Grandma Crum’s sister. Sadly, my grandma and her sister are no longer with us, but the one thing my mom could remember about Aunt Tilly was that she was a bowler, so I couldn’t help but put that little bit in the story! – Tilly’s house in the book is actually modeled (mostly) from my Grandma and Grandpa Johnson’s old house in Sandwich, location and all! I took a lot of leeway in its description, so it isn’t 100%, but it was so fun to close my eyes and picture the house from my memory! Such AMAZING memories of that little Center Street house!! 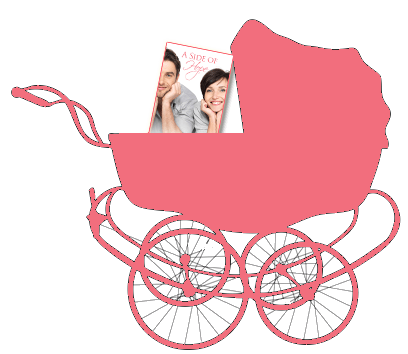 – This is the first book that I’ve incorporated, on a very tiny scale, my experience as a heart-momma. You’ll find out how once you read the book, but it was so humbling to start to be able to use Annabelle’s story, even in such a small way, in my writing. Someday, I’ll write a book where it is the focal point, but that is down the road for me. – Adam and Tilly’s backstory is deeply personal to me. While there are some pretty big, obvious differences, my husband and I too married at a VERY young age with some big, grandeur dreams of how “living on love” would look like. I’m happy to say that our story progressed very differently than Adam and Tilly’s, but it was interesting to explore the “what if’s” that come along with such a young marriage. So… I heard there are prizes at this party. Can I see them? Greedy, greedy, always thinking about prizes! Without further adu, here is the loot! – A gorgeous mirrored cross that says, “Our Hope is in the Lord” because wow, isn’t that so true?? Let me pause right here, because this is a SUPER special gift, and I wanted to explain it if you have never heard of The Giving Key. A local boutique here sells them (ONE Boutique–AMAZING owner–if you are local check them out!) and the owner was so sweet and gifted me a key last year when I REALLY needed it. It just so happens that my key said FAITH on it. Appropriate, no? Well, The Giving Keys are not meant to be kept. They are meant to be GIVEN AWAY when you find someone who “needs” the key more than you. Then, when you receive one, you can go onto their blog and share your story if you’d like! Proceeds from the Giving Key are used to transition people out of homelessness. 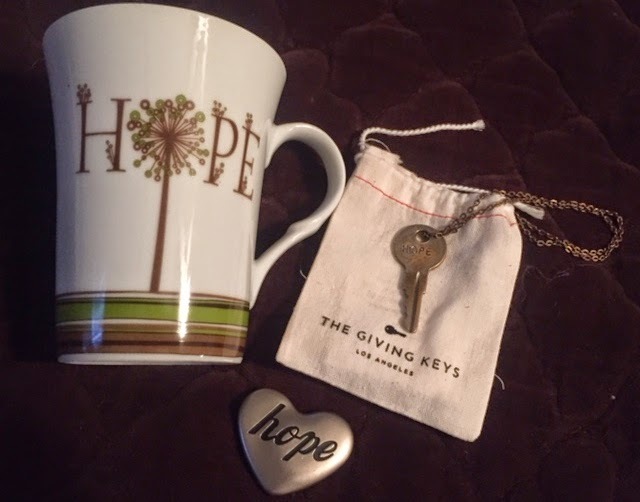 You can read more about their mission and history on their website, but it is so inspiring, and I’m SO excited to be giving away a HOPE key today!! My prayer is that whoever wins it will need a dash of hope, and will in turn find someone who needs a little hope to regift it to! I’ve already given away my Faith key to a super special woman at God’s prompting back in February, and am so excited to give away another! So…. how do I enter? Well, as usual, I’m using my friend Rafflecopter to help! This is a ONE DAY giveaway, so entries are ONLY accepted through midnight tonight! There are a few different options for you to earn more entries, but the one you MUST do is comment on this blog with either a QUESTION for me or SOMETHING YOU ARE HOPEFUL FOR. 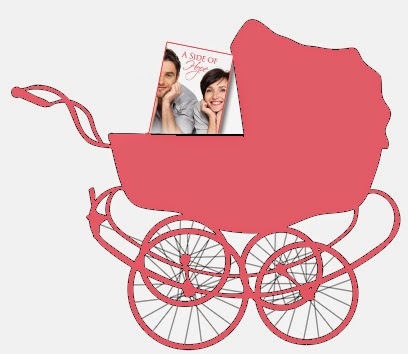 So… what’s this little baby book about? God must have misunderstood her wish, though, because moments later, He brings her the one person she never wants to see again. So… Where do I get this little baby book? Geez, full of questions today! I LOVE IT!!! This is a GREAT question, actually! 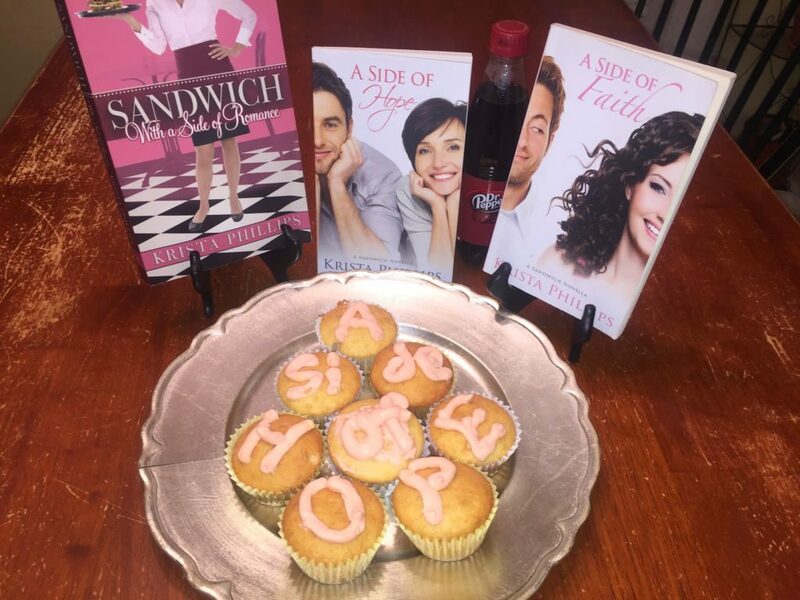 Below are the links for purchase… and if you want to check out the OTHER sandwich books (Sandwich, with a Side of Romance and A Side of Faith) their links are on their book covers on the sidebar! Okay. YOUR turn!!! If you have any more questions to ask me, bring ’em on in the comments section! Otherwise, I’d love to chat about hope. It’s such an awesome topic. What does hope mean to YOU? What are you HOPING for right now? Has there been a time in your life where HOPE in God has impacted you? Let’s share!!! I'm curious…both for supporting you and also wondering how the publishing thing works… Do you get paid more for the print or e-book version? When do you find time to do your writing? I too have four children and some days I hardly find time to get through the mail. I hope to one day be organized, but I have been saying that for years. I pray often for God to teach me how to be a better steward of my time, but I can't seem to get it right. Lovely question! The true answer is kinda long winded, but I'll do a short one. #1 – I treat it as a job. I was a working mom, having a fulltime job working 40 hours + each week before Annabelle. So viewing writing as a career (even the $$ payoff at this point is significantly less while I build my readership, LOL) helps in my time management. #2 – I don't do everything. Seriously. I cannot be a perfect writer and a perfect momma. NO one can, even without the two. I don't do PTA. My kids don't do 3 after school activities each. (they are limited to 1 each, and even that, they are seasonal) I value a "lived in" house over a perfectly spotless one. I may-or-may-not have fished jeans out of the dirty clothes for school in the morning on one or more occasions when a deadline was tight and I forgot about laundry. Basically, I allow myself to be not perfect, and just do my best at each. I also have a teenager who babysits some for me so I can take my booty to Starbucks and write (I write SO much better when I'm not staring at the 100 things that I could be doing around the house!) So, if you value a super clean house (I know some do–totally okay!) and if you juggle piano lessons and gymnastics and ballet and soccer, then maybe writing needs to be a when-they-are-a-little-older thing. And that's okay. God gives us all different seasons, and we all need to be obedient to HIS call, in HIS timing. And even if you dont' write-write now, you can still take little snippets of time for you to write for fun. After kids are in bed, spent fifteen minutes day-dreaming a story. Write out a fun first chapter. Save those fun ideas. use your little bits of time here or there just to enjoy writing. That's how I first got started. My first book was written between 10pm and 12am and on my lunch breaks at work! Oh, and my kids also go to grandma's house a week every summer. That helps too! I get a LONG written that week!!!! I hope my two daughters who are getting married this June and next have long and happy marriages! Also Krista I was wondering when you will be publishing your next full length novel? ohhh, such a great thing to hope for!! Wishing your daughters the best on their upcoming weddings!!! And my next full length novel! GREAT question. Well, I have ONE more novella to publish, A Side of Love, and then after that, I'll be finishing out the series with a full length novel called, The Greatest is Love. A Side of Love will release later this year (probably late summer/early fall) and then The Greatest of Love will release early in 2016! Vickie, sounds like you are WELL ACQUAINTED with the need of HOPE!!! HOPE is the one thing that kept us going during Annabelle's long journey— I REFUSED to give up hope that God would get glory in the end, and I focused on that with a fierceness I did not have. I think it's when we go through things like what you are going through, that we REALLY see just how true the scripture is, that when everything else is crazy, FAITH, HOPE and LOVE are the three things that remain when we have Jesus! Sorry–when on my iPad if I try to go back to correct something, it won't let me type anymore…and I can only delete all or post. Anyway, you can see that Hope is very special to me–God seems to be placing Hope all around me. Maybe I need to add Hope as a character in one of my WIP's. 😉 I like the idea of writing a story about an older heroine & hero's–since I'm older as well. My BFF from HS days is being blessed w/ romance again, after 15 years of being single following a divorce. I will be sharing this book with her. May God Bless you & your family, especially Annabelle, and your book as well. Hope = believing that something will happen. I'm hoping and praying for a clear mind to make godly decisions. I loved your blurb. Made me smile. awww, thanks!! Miss you too! I just found out I am to have my very first grandchild next fall. I hope (and pray, of course) for good health for the baby and the mother (my daughter). Congratulations on the new book! Will be HOPING and praying for a fabulous birth and a super healthy baby!! Krista, do you come up with all your characters as you write each book or do you have an idea of some of the residents that live in Sandwich who are just waiting for the right story to be introduced? As I write each book, definitely! I actually try to stay away from real people…. Funny, in the FIRST book, the "owner" of the salon (who is a bit mean….) had a different name, but when my mom read it, she let me know that the name I used was actually the name of a lady she used to know IN Sandwich who worked at a salon (and the lady was a bit, uh, high strung) so I changed the name to make sure no one got offended!! Now, I DO get inspiration from real life people, but usually it's just little bits, maybe a quirk someone has that would be fun to write into a character, or a situation that I decide MUST go in a book. Hope is my inspiration for moving forward. It keeps me centered yet dreaming!! 🙂 Congrats Krista!! Darn it, I love your covers!!! And thank you! That is one of the best complements an indie-author can get! I can't WAIT to be able to reveal my "Side of Love" cover— it, I think, is gonna be my favorite yet! My hope is that my son will live a God driven life to lead others to Him. That is a FABULOUS hope!! Ahhh. Well, I always liked to READ, and in school when we had to write a paper, I tended to put it in story format if I was allowed to and LOVED IT. So I guess I'd say I had more a passion for story than a talent for writing. Writing part is very much learned! (and I am NOT a fantastic "writer" in a literary sense— there are so many writers who are very lyrical and prolific, but I like to write 'real' so I just write like I talk, LOL) So it was the story part that drew me at an early age! I remember in the 9th grade, we had to write papers that described ourselves in a unique way. One of the funny ways she had suggested was to write what our obituary would say. I decide to write mine as a story from the perspective of my husband and kids. I remember I had 3 kids, an 8 year old girl and twin toddler boys, but I had died a few years before, and my daughter was asking daddy about her mom, and so he described me to her, thus fulfilling the project. I can not wait to get my copy. I think it may actually come today. Yay!!! So excited! Looks great! Can not wait to read! Thanks for sharing your good news on the release day for your book, sounds like a wonderful read! And for the chance to win a copy. Blessings to you and yours, Krista! Best part of writing: This is hard to put into words, and is gonna sound like a bit of a cop-out, but it's true. The best part of writing is knowing that God is using me for something. My heart has ALWAYS been for everything I do to be for God's glory, and knowing that God is using these little stories for his glory is the very best thing about writing. Worst part about writing: Sleepless nights, tight schedules, the whole "selling" part of it— I'd be so much happier just writing books and putting them out there and not having to work on the marketing/selling part so much, LOL! My characters inspiration comes from various places– usually they are a combination of my imagination and little parts of many different people I've met throughout the years! Krista! Haven't 'seen' you in ages! Congrats on the new book. I haven't *seen* you in ages either!! THANKS!! Valli— LOVE THIS!!! So thankful God is providing and leading you to just the right place!! Will be praying for you!! I am hope-filled for my kids' futures as my oldest (special needs) daughter graduates in a couple months and begins the transition to work with a job coach AND my junior son seeks an opportunity to play sports in college to help pay the tuition bills. And I can't forget my youngest who will be transitioning to middle school and is in the throes of the sometimes nasty frenemy drama. My first question was already answered, so I'll ask a different one: How supportive is your agent when it comes to the indie-publishing angle? Is your hope to indie-pub the stories traditional publishers won't buy while still trying to be a hybrid author? And yikes… I feel you on kiddo transitions! I have one starting HIGH SCHOOL, one starting MIDDLE SCHOOL, and a third starting Kindergarten this year!! The girl drama is—TOUGH! HOPE—yes I like to think there is hope amidst all that craziness too! My agent is super supportive! I was already starting down the Indie path last summer when I signed with her, so she was aware and fine with it, and still feverishly pitching my next book to traditional pubs. I'm SO thankful for her wisdom and advice. My hope is to be a hybrid author, doing traditional publishing but filling in the gabs with indie-publishing, and indie-publishing the books that don't quite fit traditional requirements (the novellas were a good example) I think if done right, Indie and trad. can work hand in hand and help support each other! How many hours do you dedicate weekly to your craft? It totally depends on the week. I estimate between 8 and 20 depending on what I'm doing. The last two weeks it was probably a LOT more than that trying to get everything done for the release. I'll take a break for the next two weeks to unwind and catch up on laundry/housecleaning LOL. Oh, and I try to take December mostly off. Congratulations on your new book! My hope is that someday I too will be published. How long have you been writing; how long were you working on your new book; what is the story of how you got your agent? How long I've worked on this current book: TOO LONG!!! I wrote the first 2/3rds of it rather quickly last fall, but then I got STUCK big time. I prayed a lot, knowing I was missing "something" but not being able to figure it out. I took December off and then finally finished in January. I've been working on edits since then. I love that your launch party is on your blog and not on facebook. I've seen a lot on facebook lately. Was that a conscious choice? I also love your book covers. I think you are a perfect example of an indie author doing it right. Your covers are amazing. You're so sweet, thank you!!!! When my first book released, we did a FB party (I did a dual party with a friend who was releasing a book at the same time.) That was SO MUCH FUN and worked really well, but was a LOT of work. We also did it open house style, but we had hourly giveaways. We did it a LOT different than others did, and while I liked it, it was a LOT of work. I'm hopeful for a descent job that pays more than I make now. A good hope! God knows our needs and I'm HOPEFUL that he will provide in the best way for you! Krista how did you come to be an author? I've always loved to read and LOVED stories, but in 2007, God kicked me in the booty and said, "Go forth and write, Dork!" Okay, so he didn't call me a dork, but he made it pretty clear. Then I just spent a LOT of time writing, a lot of time networking, a lot of time learning craft, and God has totally blessed! I am amazed and in awe of Him, that he lets me do something that I love to bring him glory! Okay, FYI. I changed my comments form a bit as some where having trouble commenting… but it erased all my "replying" so now they are just comments…. I would have put names if I had known that, WHOOPS!!! Krista, I just wanted to stop by and say hi and congratulations! I wish you much success with your new book baby! Sarah — my AMAZING crit partner!!!! THANKS for coming friend… this book would be CRAP if not for you! Congratulations, Krista! I'm so glad I made it in time for the party. I first stopped by my FB to invite others, I hope they can come. Your new book sounds incredible. I'll answer the question of hope. What do I hope for? 1. I hope for the salvation of two of my children. 2. I hope to please God. 3. And …well….I really do hope I can one day get a book published. 1.) I HOPE for that too, and will be praying! 2.) i don't hope for that for you, because I KNOW you already do. Jesus smiles a big ol grin when he sees you!! 3.) I DO hope for that for you too! Just wait! It'll happen!! Maybe someone has already asked this, so I apologize if it's a repeat question, but how do you find/choose a title for your book? I have been in a bit of a slump lately. It seems that no matter what I do, I cannot lift these blah feelings of depression, unworthiness, worry that others think I'm overbearing/annoying/etc, and pretty much any other negative feeling you can name. But, I am HOPEFUL that, by the grace of God, He can and will overcome these feelings with positive, good feelings and thoughts. I am HOPEFUL that the enemy will get out of my mind and leave me alone for good, because I have had enough and he is not welcome here anymore! 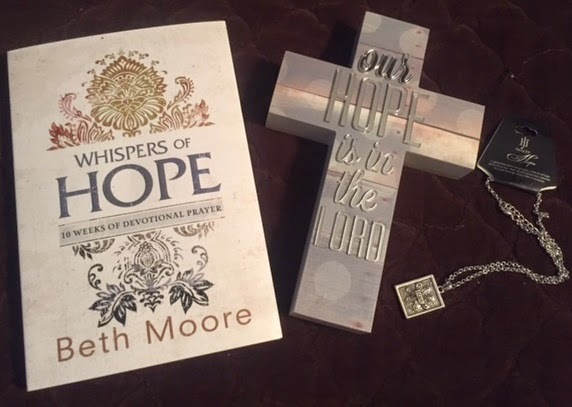 I loved the ideas of novellas that were "themed" based on Faith hope and love, thus A Side of Faith, A Side of Hope, and to come later this year, A Side of Love. So yeah, it just depends. My first working title was "out of the blue" because I hoped my book title would hit me "out of the blue" LOL! Kristy— I am seriously so very much the same way! We need to have coffee (or hot chocolate!) sometime!!!! I am totally hopeful for the same thing, girly!! I'm glad I'm not too late for the party. I enjoyed your first two books; this one sounds very good as well. I'm wondering if there are more Sandwich books planned. I really enjoy the characters. One thing I'm hopeful for is that my son will return to the Lord. I HOPE THEY FIND A CURE FOR ME!! One day I hope MS is only known for Mississippi and not Multiple Sclerosis. Pam, that is a great thing to hope for!! I'll be praying as well! MisWilson–I'll join you in hoping for that too!! Thanks for stopping by!!!! Becky, LOL! You can do it, you can do it!!! !